A jewelry store’s pearl counter is a fascinating place. These enchanting gems have represented beauty and perfection ever since man discovered them in ancient times. They have been the subject of countless tales of history, beauty, myth and elegance. The Arabian Gulf was the world’s first source of natural pearls and remained so for centuries. Natural pearls from the Gulf are notable for their transparent and high-lustre nacre. Together with pearls from the Red Sea and the Strait of Manaar, they have been referred to as “oriental pearls” and are highly valued. Part of a pearl’s appeal is its organic origins: It comes from a living animal, a mollusk. And because pearls are slightly porous, they warm up against the skin as they are worn. The wearer and the gems become one. The exciting array of pearl choices available today can be overwhelming. When you combine the variety of colors, sizes and shapes with metals and other gemstones in rings, necklaces and earrings, the possible combinations are practically endless. So before you set off to buy pearl jewelry, you should understand the basics. Are you looking for natural or cultured pearls? Do you know what to look for in terms of size, luster and color? What price range are you interested in? How are some pearls treated to enhance their appearance? These are all good questions to consider before you begin to shop. A retailer who knows the types of natural and cultured pearls that are available and the factors that determine their value will be an invaluable resource to you as you explore pearls. In the meantime, here are some basics to get you started. Pearls are natural or cultured and grow in mollusks that can live in either salt water or fresh water. They are made up of layers of calcium carbonate most popularly in the form of nacre, a natural substance produced by pearl oysters that coats the inside of the animal’s shell. This beautiful, lustrous nacre is the very essence of a pearl. Natural pearls are extremely rare. The Arabian Gulf is the most important source for natural pearls – 70-80 percent of all pearls came from there until the 1950s. The island of Bahrain was a centre for trade with northwest India and what is now the modern Middle East. A 4,000-year-old pearl was uncovered in 1989, and excavations at the ancient Bahrain’s Dilmun settlement have confirmed that pearl fishing has been going on for at least 3,000 years. Natural, saltwater pearls from the Arabian Gulf come from the Pinctada radiata and Pinctada margaritifera. Persian Gulf pearls range in color from white to dark cream and tend to be more yellow than those from the Red Sea and Strait of Manaar, whose characteristic colors are very light yellow, cream and very light pink. The Red Sea also produces some pearls in darker hues that range from intense pink to light to dark violet. Natural saltwater natural pearls are also found occasionally in Baja California, Venezuela, Myanmar, China, Japan, India, French Polynesia, Australia and Africa – the same regions that have cultured pearl industries. If you ask someone to describe an Akoya pearl, they will most likely describe a white, round, lustrous gem cultured in Japan and China in Pinctada fucata (martensii). Most akoya cultured pearls are white or cream and some have hints of rosé (pink) or green. The akoya oyster is relatively small, so it doesn’t usually produce a cultured pearl larger than 9 mm. Natural pearls from Pinctada fucata (matensii) are extremely rare. 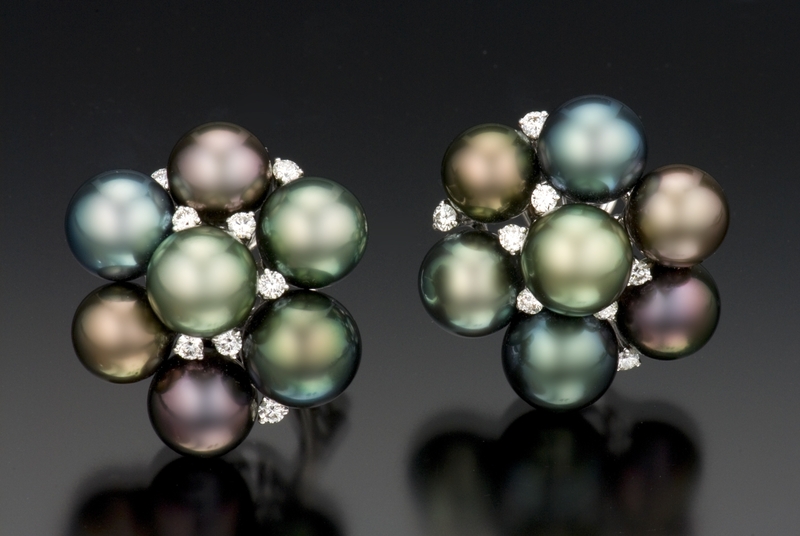 Tahitian cultured pearls have only been on the market since the 1970s and come in colors including eggplant purple, peacock green, metallic gray and grayish blue. The mollusk that produces them (Pinctada margaritifera) is native to French Polynesia and is farmed there and in the Cook Islands, Fiji, Australia and New Zealand. South Sea cultured pearls come from one of the world’s largest pearl oyster (Pinctada maxima), which produces cultured pearls that can measure 15 mm or larger. They are farmed in Australia, Burma, the Philippines and Indonesia. While South Sea cultured pearls occur in other colors, silver, white and yellow (sometimes referred to as “golden”) are the most common. Cultured pearl farmers in China produce the overwhelming majority of cultured freshwater pearls. These cultured pearls vary widely in color and are generally more affordable than salt water cultured pearls. Sizes are comparable to akoya cultured pearls, with a range between 2 mm and 13 mm, although larger sizes are now available. Fascinating new cultured pearls from fire balls to soufflés have been emerging from China in a dramatic array of colors. The chief cultured pearl-producing mussel in the U.S. is the “washboard” M. nervosa. Only a small fraction of the total number of freshwater cultured pearls produced come from the U.S.
GIA, the world’s foremost authority on diamonds and gems, created a pearl description system, in order to evaluate the quality of pearls. GIA’s 7 Value Factors include Size, Shape, Color, Luster, Surface, and Nacre. Be sure to ask your sales associate to go through these with you. Size: As with other gems, a larger pearl (measured in millimeters) is typically more valuable. The larger the pearl, the more rare and costly it tends to be. But fine quality pearls can be small, and low quality pearls can be large, so a pearl’s ultimate worth depends on how it combines the complete mix of value factors. Shape: While round is the most familiar shape, pearls come in a parade of forms (round, near round, oval, button, drop, semi-baroque, baroque). No matter what its shape, if a pearl is or symmetrical, it will be more valuable than one that’s irregular. Color: A pearl’s color is a combination of its dominant bodycolor, overtone, the subtle colours that seem to come from within the pearl, and orient, the “play of color” you see when the pearl moves.. Cultured pearls display a broad palette of subtle hues, ranging from warm (yellow, orange and pink) to cool (blue, green and violet). Luster: The intensity of light reflected from or just below the surface of the pearl, its luster, contributes the most to the beauty of a pearl. The effect is an inner glow from the heart of the gem. A pearl with excellent luster will look bright and shiny, while one with poor luster is dull and far less valuable. Fine akoyas tend to display a bright, mirror-like gloss. Other pearls tend to feature a softer, satiny luster. Surface: A completely clean pearl is a rare treasure. Since rarity influences value, the prices of such pearls run extremely high. The number, nature, and location of surface characteristics (abrasions, bumps, chips, cracks, etc.) can affect the value of any pearl. Numerous or severe surface irregularities – such as chips or gaps – can threaten the durability of the pearl and cause it to break or peel and considerably lower its quality and value. If a surface characteristic is minor and located near a pearl’s drill hole, where it’s less noticeable, it will detract less from the pearl’s appearance and ultimate value. Other value factors can minimize the effect of surface characteristics on a pearl’s worth. If the pearl is large and highly lustrous, for example, these pluses can outweigh a slight surface characteristic or two. In fact, excellent luster makes some surface characteristics less noticeable. Nacre: Nacre is the very essence of the pearl itself and nacre thickness does affect the value. Quality cultured pearls have ample thickness to allow the pearl to display its beauty. Matching: The uniformity of the appearance of pearls in strands and multi-pearl pieces is called matching. Now that you’ve gotten your pearls, you should know a few things about taking care of them. To retain their beauty, they need a certain amount of moisture, which is why you should avoid storing pearls in an airtight or overly dry environment, such as a bank safety deposit box. The human body conveniently provides just the right amount of moisture. Worn often and properly cared for, pearls can look as good in 50 years as they did the day they left the store. Pearls are not the most durable of gems. Most everyday items at home and in the office are tougher than pearls, so careless contact can cause damage them over time. Chemicals are the primary threat. Perfume, makeup and hairspray contain ingredients that can eat away the nacre, permanently dulling it. Many cleaning products contain chemicals such as ammonia and chlorine, which can pit gold alloys and quickly damage pearls. Chlorinated swimming pool water is also hazardous. Avoid wearing pearl jewellery when cleaning the house or doing yard work. The best way to clean your pearls is with a soft damp cloth, ideally after each time you wear them. Consider taking a course to gain a deeper understanding of this fascinating gem. GIA offers an online pearl course in its gemmology eLearning curriculum that you can take from the comfort of your home. It’s a fascinating look at the world of pearls, including their origin, how they get to market, and the GIA 7 Value Factors used to describe their quality. Or, you can choose to take a one-day instructor-led GIA Pearl Grading class where you’ll learn to evaluate the quality of freshwater, South Sea and Tahitian pearls. To find out more about pearls and GIA’s pearl courses, visit http://www.gia.edu. See image courtesy of GIA.